This book presents the results of an experiment in interdisciplinary collaboration to clarify theories of morality and anthropology and philosophy, showing how each may be enriched by borrowing from the other. Pooling the resources and methods of their respective fields-anthropology and philosophy-May and Abraham Edel examine the wide range of moral differences in the world "to establish 'coordinates' for the more systematic mapping of particular moralities, to explore more explicitly the relations of morality to cultural patterns and social processes, and to see how philosophic issues of ethical theory become refined and reformulated when their cultural content is made manifest. "The book contains an implicit suggestion that the anthropologist should focus on morality as an independent area of study and that the philosopher should stop treating morality in isolation. 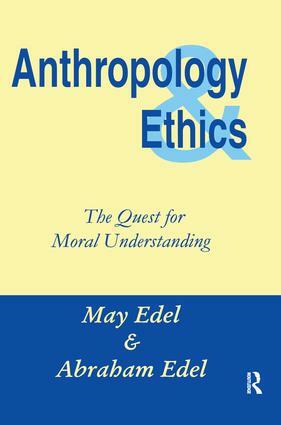 Anthropology tends to include morality as an incidental part of other inquiries. Philosophy, on the other hand, tends to cut morality off from the framework of psychological and cultural processes; the result is a kind of deadlock in ethical theory. The Edels observe that to develop a working concept of morality at least as well developed as that furnished for religion, anthropology can benefit from philosophic methods of analyzing concepts and from philosophical ways of conceptualizing problems of ethical theory. On the other hand, philosophy can use the methods of anthropology, to approach morality in more meaningful terms. This study is not addressed only to professionals; its aim, rather, is to "provide an orientation to morality itself in a world in which human problems are becoming extremely complex and have to be confronted directly as moral."